My family plays marbles. Not the “sit around a circle flicking marbles at eachother” 1950s marbles. This game is more like the game “Sorry,” and my family has played it for as long as I can remember. It originated from my dad’s side, with my Grandma Betty. Every visit would always involve a slew of marble games that would feature a variety of things: My grandma punching whoever was closest to her for knocking her marble off, holding a lighter under her die to put it in the “hot seat” if it didn’t roll a 1 or a 6, someone getting pinch bruises, and my grandma yelling, “You’re getting my Irish up!! !” My best memories of my grandma are always somehow tied to marbles. 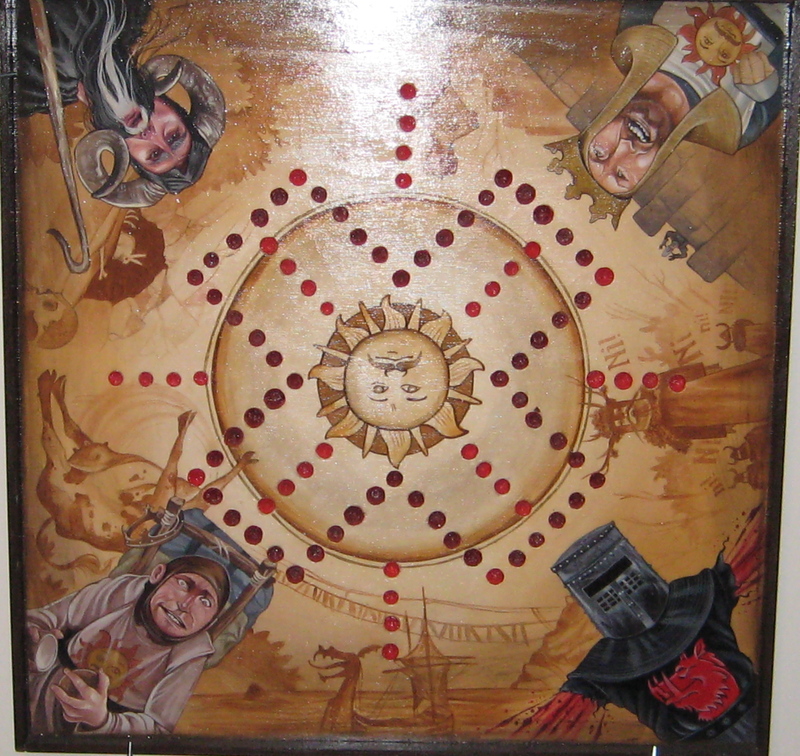 The game involves each of 4 players having 4 marbles. You team up with the person opposite the board from you. You must roll a 1 or a 6 to get a marble out of your start point, and keep rolling. 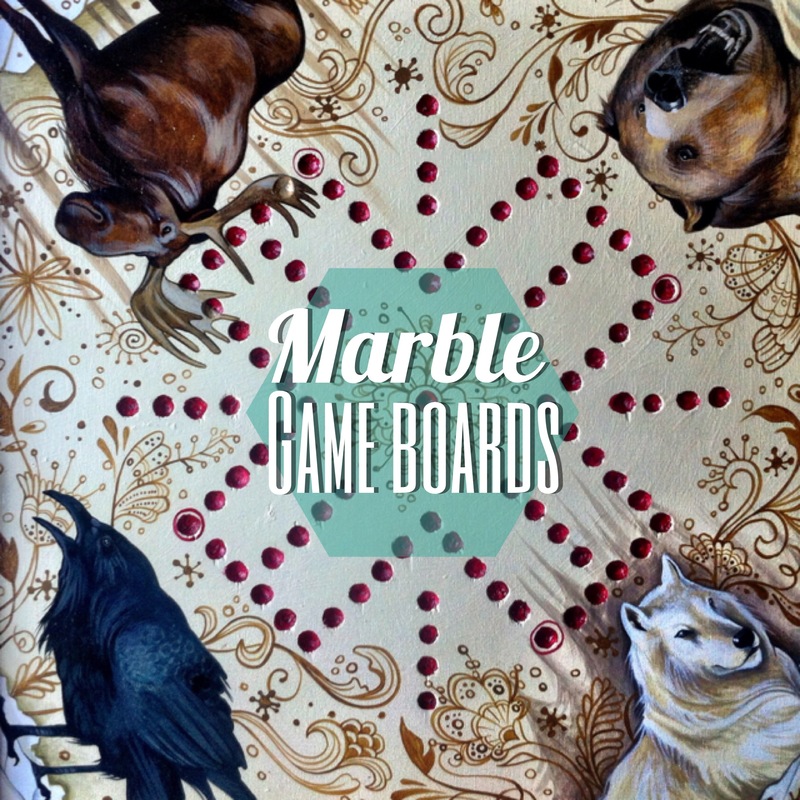 You must get all of your marbles around the board and into your home row, and then you can roll and play for your partner. First team with each player’s 4 marbles home wins. If you land on another marble, you can send them home. Marbles has fierce suspicions…some people have “lucky” dice, and will only play with them. If your die start “listening” to another player’s chants, it’s time to get new dice. For that matter, if you “chant” numbers at another person’s dice (to avoid them getting the number you want), sometimes it works. No one else should touch your dice, or they’ll start “listening” to them. Unspoken rule: “First one out, last one home.” The fun part: your win is NEVER guaranteed. Just because you think you’re winning, the game could change it all and give the other team the advantage. Our family gets LOUD with it. We play wild, we yell, we laugh, we get aggressive. It’s fun. The first marble board I remember at my Grandma Betty’s house was very plain. Apparently my grandpa had made it, and they’d had it forever. It had years worth of marble playing on it, and it was awesome. Several years ago, my father made a few plain ones to keep back home. 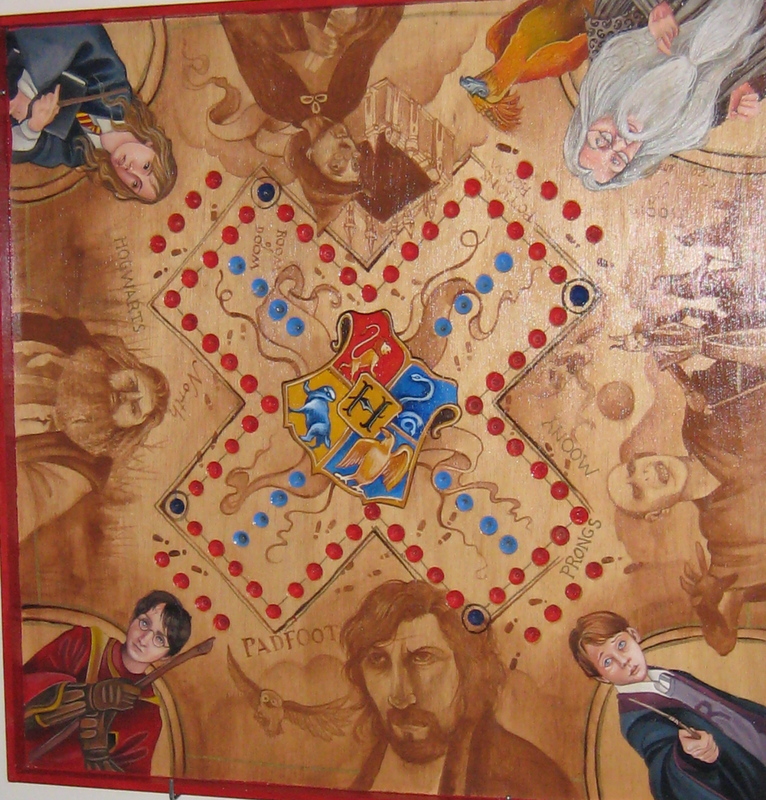 I don’t remember if he asked me, or if I sort of took over, but I painted some as gifts–an ornate garden one for my mother, a maze with trompe l’oeil butterflies for me, a lizard one for my sister, and an Egyptian one for my dad. The idea was to make each corner (for each player) be a strong, cool character that each person would want to play. Since then, not only have we spread marbles around to friends we’ve known (who always fall in love with the game), but I’ve made several as gifts over the years. I have a Harry Potter one for my husband, and a Monty Python one for myself. The one at the beginning of this post was for a friend as a reminder of our time in Alaska. Yep…and once you’re in, your in!!! What is seen can never be unseen. Heehee! I am VERY impressed! Beautiful work! Must have taken quite a bit of time. Did you use Polyurethane? Spray on? Wonderful wonderful job. Yes, they’re spray varnished with Kamar varnish afterward, Sometimes painted with gloss varnish. Thankyou very much!